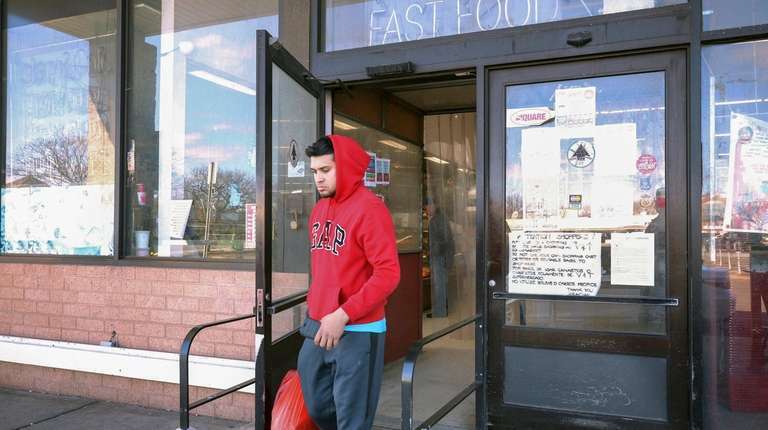 Retailers, food warehouses and related establishments in Nassau and Suffolk counties with what the state describes as "critical deficiencies" fell to 12.5 percent in 2018. The state used letter grades for the first time last year. The percentage of food retailers on Long Island with major food-safety violations fell 10 percent between 2017 and 2018, the first year letter grades were posted for such businesses, according to state records. The proportion of retailers, food warehouses and related establishments in Nassau and Suffolk counties with what the state Department of Agriculture and Markets describes as “critical deficiencies” fell to 12.5 percent in 2018, from 13.9 percent in 2017. Statewide, the percent rose to 27.6 percent, from 25.7. An “A” is a passing grade that means no “critical deficiencies” were found. Critical deficiencies include those that can lead to food-borne illnesses. Although the letter-grade system began Jan. 1, 2018, the state for years has had identical language describing the three food safety categories. “The letter grade is to simplify the results of the inspection,” said Jennifer Trodden, a deputy commissioner of agriculture. The “critical deficiencies” the state cited at Long Island businesses over the past few months include moldy strawberries, “rodent-defiled” flour, “dark grime” on a deli slicer and employees who don’t wash their hands. One of the most serious violators was V & C Supermarket in Hempstead. A Nov. 15 inspection found “150-200 fresh intermingled with old appearing mouse droppings” on the outside of bags of rice, on rice storage pallets, and in several other locations, including the floors of the bakery area and kitchen. A March 14 re-inspection found between 430 and 600 "fresh and old appearing" mouse droppings, including on a rack containing bags of flour and rice in the kitchen and on the floors of the kitchen and meat-cutting room, according to online state records. After both inspections, the state gave the store a C.
Rodents and their feces can transmit viruses and bacteria to humans if they come in contact with food, Trodden said. Health problems that could result include diarrhea, vomiting and upset stomach — and, for some people who contract food-borne illnesses such as salmonella — death, she said. On Nov. 15, the inspector also spotted a live cockroach on the bakery floor, chicken and pork in the “hot holding unit” at temperatures far below the 165-170 degrees required by law for most foods, mold on equipment, and a lack of hot water in restrooms, a health issue because cold water is not as effective as hot water in killing bacteria. On March 14, the store was cited for food equipment and utensils that were "unclean or not properly sanitized and likely to contribute to contamination." Customer Alvaro Orellana, 47, of Hempstead, was disturbed to hear of the rodent and cockroach problem. “They have to pay more attention to cleaning,” he said in Spanish. Gabriel Rodriguez, 50, of Hempstead, said he is less likely to shop at the store now that he knows of the problems. Store manager Alan Luu said Wednesday of the mouse problem, “It’s not a big issue. It’s old droppings, it’s not new." Luu said he did not know why the inspector said March 14 that there were fresh mouse feces. He said that, after the November inspection, the market hired an extermination company and cleaned the store more rigorously, and there have not been mice since January. V & C customer Edison Pérez, 58, of Hempstead, said he never noticed the inspection notice and said the letter grade should be larger. The letter is amid other text on a sheet of paper at the store entrance. In an interview, Trodden first said “we started out with a very large grade, letter, and then we kind of turned it to a smaller kind of approach” after meeting with representatives from the food industry, including the Albany-based Food Industry Alliance of New York State, which represents grocery stores and other food-related businesses. “If consumers want to see a larger letter, I think we would be open to that,” she said. Alliance president and CEO Michael Durant said large letters are unnecessary because information on the stores’ grades are online and must be displayed at store entrances. Retailers that don’t post their letter grade near the entrance can be fined $600. The agriculture department works with businesses to help them comply with food-safety laws, a department spokeswoman said in an email. “When all other options have been exhausted and public health is at risk,” the department may seek a court injunction to close a business, she said. Some critical deficiencies involve a lack of record-keeping. Jericho Cider Mill in Jericho was given a C on Feb. 1 for not having records for pasteurization during cider-making, and for not having other food-safety documents. Ted Ketsoglou, manager of the cider mill, said all cider is safely pasteurized. Previous inspectors had not asked for records documenting this and other procedures, he said. The business will have the proper documents by the time of the next inspection, he said. A re-inspection is planned for early April, an agriculture spokeswoman said. Trodden said “pasteurization is a big deal” and scientifically proven to prevent food-borne illnesses. An inspector cannot on the spot confirm that pasteurization took place, she said. “The only way to see that and verify that is through record-keeping,” Trodden said. The public, online database had long included only the results of the most recent inspection, so if a store’s score changed from C to A, only the A would be listed, state officials said. The C would still be reflected in data used to compile year-end data. The online database has shown a far lower percentage of Long Island retailers with a B or C than the calendar-year statistics — only 1.6 percent in the online statistics that were posted Feb. 13, compared with 12.5 percent for all of 2018. The agriculture spokeswoman said March 19 that, as a result of questions from Newsday about the disparities, the agency would change its online database to display all letter grades an establishment receives within the 12 months before the compilation of the online data. For example, if a business first receives a C grade but, upon re-inspection, gets an A, both the A and the C would be displayed online, she said. In a new online posting this week, a number of stores with A's also have lines that show they previously received C's. In addition, the Feb. 13 online database only included about 69 percent of the inspected establishments on Long Island and the most recent one has less than 52 percent. It’s unclear why so many establishments are missing. Trodden said March 12 it’s because the database “is only a snapshot in time.” But the Feb. 13 posting includes numerous inspections from 2016 and 2017. The March 25 one includes only 2018 and 2019.